Corporate power: Root of today’s evils? The archbishop of Canterbury joins a growing number of religious leaders who condemn the growing power of the corporate system. A diverse roster of politicians has lined up to demand that Amazon, the retail giant whose commercial aspirations seem without bounds, change the way it does business. President Trump has repeatedly charged the company, whose owner, Jeff Bezos, owns The Washington Post, with shirking tax responsibilities, while Sen. Bernie Sanders, I-Vt., is on a quest to force Amazon and other business behemoths to bear the cost of public assistance required by their employees. A new voice emerged this week, from a different sort of bully pulpit. The archbishop of Canterbury, Justin Welby, targeted Amazon in a denunciation of corporate greed and gaping inequality – themes that have become the stock in trade of the former oil executive and the leader of the Church of England who has warned that the country is facing a “crisis of capitalism” fueling extremism and ethnic tensions. In his speech Wednesday at the annual conference of the Trades Union Congress in Manchester, England, the archbishop was only slightly less apocalyptic, and more specific. He described the so-called gig economy, defined by temporary and independent work, as a modern manifestation of industrial-era oppression of workers. The archbishop suggested that Amazon’s business practices demonstrated the perils of lax economic rules justified in the name of flexibility and innovation. “When vast companies like Amazon and other online traders – the new industries – can get away with paying almost nothing in tax, there is something wrong with the tax system,” he said. The archbishop said the damage was not just to individual workers but to the communities in which they live. The Seattle-based business, which this month became the second $1 trillion publicly listed U.S. company, has defended itself against these sorts of assessments. When accounts published last month showed that the tax bill for Amazon’s main U.K. subsidiary had fallen last year to 1.7 million pounds, or about $2.21 million, despite soaring profits of 72.4 million pounds, the company said: “We pay all taxes required in the U.K. and every country where we operate.” The falling tax obligation owed in large part to deductions from share-based awards to staff. Meanwhile, revenue from retail sales in the U.K. is reported through a holding company in Luxembourg, where Amazon lists its regional headquarters. The practice, also employed by leading technology companies, has raised eyebrows in Britain and beyond. Separately, the company has rebutted the claims leveled by Sanders by saying that figures showing a vast share of its workforce relying on public benefits include temporary workers and staff who choose to work only part time. In April, the New Food Economy, a nonprofit news organization, used public records, in partnership with The Intercept, to reveal that scores of Amazon employees use public assistance to support themselves. The data indicated, for instance, that one-third of the company’s employees in Arizona use the federal Supplemental Nutrition Assistance Program, formerly known as the Food Stamps Program. “Amazon has created more than 25,000 good jobs with good pay and benefits across the country and since 2010 have invested over 9.3 billion pounds in the U.K.,” a spokesperson said in an emailed statement to The Washington Post. The jeremiad by the leader of the Anglican Communion amounted to a stinging indictment of Amazon. His warnings were also more forceful than those offered by British lawmakers, who have long expressed concern about tax evasion and the harm done to UK-based businesses but have not enlisted the searing language used by the archbishop, who couched his critique in religious terms. British policians have also struggled to enact policy addressing the issue. By no means, however, did he avoid politics. 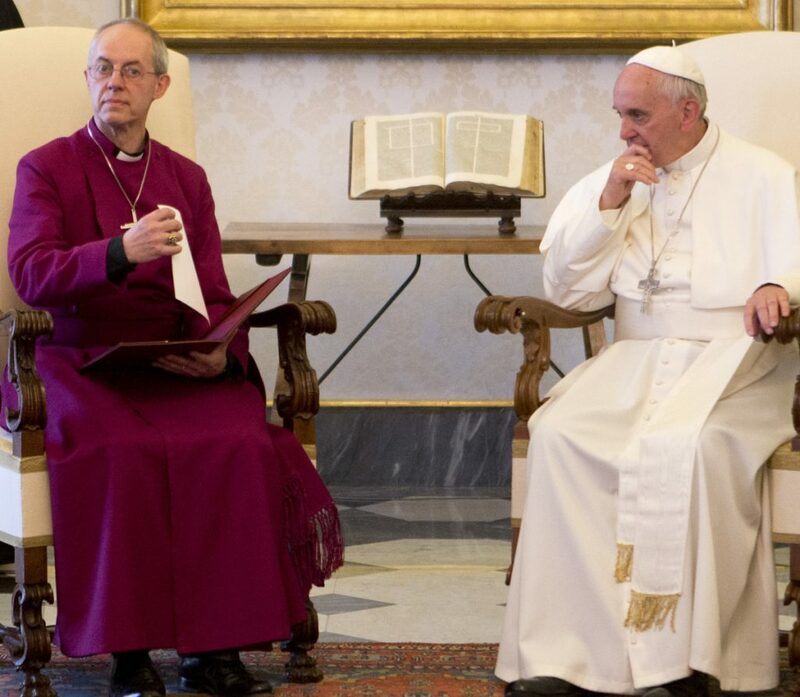 “The Bible is political, from one end to the other,” Welby said. Welby’s effort to link Christian teachings to public policy is shaped by his own path to ordination, according to biographical accounts. The gap between real earnings and the pay awarded to chief executives painted a dark picture of the British economy, the archbishop said. According to an annual review conducted by the High Pay Centre, top pay at businesses on the Financial Times Stock Exchange 100 Index rose 11 percent on a median basis between 2016 and 2017, whereas average earnings increased 1.7 percent, failing to keep pace with inflation. The speech came days after the release of a report – “Prosperity and justice: A plan for the new economy,” written by a panel of business executives, scholars, activists and church leaders, including the archbishop – recommended sweeping changes to the British economy, including an expanded role for the state in the economy.